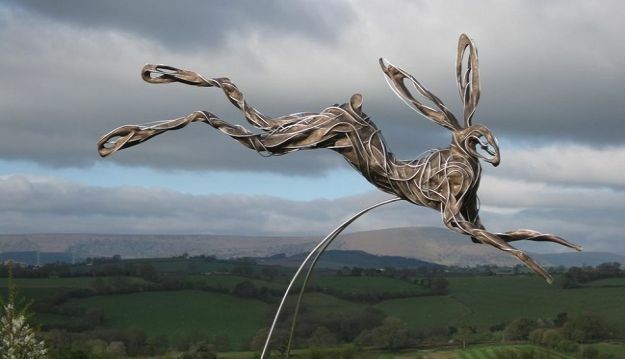 Marks Hall is hosting an outdoor exhibition of sculpture this summer, from 1st to 30th August 2015. Over 200 acres, the Gardens and Arboretum at Marks Hall are an inspiring setting in the Essex countryside for more than 230 pieces from over 30 national and international sculptors. There will be works in a huge variety of materials including stone, marble and metal as well as glass, wire, wood and willow. There will also be kinetic installations. All works are for sale through the exhibition catalogue. This exceptional arboretum with an enviable collection of mature trees, woodland and leafy paths provides a unique setting for this exhibition. With carefully selected sculptures for homes and gardens set throughout the formal walled garden, ornamental lakeside areas and spectacular Gondwanaland, this presents a new way to view and experience the stunning landscape. There is a delicious selection of refreshments available in the Barn, and Pound Field located near the Visitor Centre, offers a wonderful spot for picnics with shade provided by oak trees. We welcome pre-booked coach parties and group bookings at Marks Hall Gardens and Arboretum throughout the season. Whatever the time of year you choose to visit there will always be something of interest. During the summer, Marks Hall is open Tuesday to Sunday 10.30am until 5pm, last admissions half an hour before closing. Closed Mondays except Bank Holidays. Normal garden entry applies, there is no extra charge for the sculpture exhibition. Please see the website or call the team at Marks Hall on 01376 563796.